Customers of the Russell Press sometimes request help with international standard book numbers (ISBNs), bar codes, and other matters in order to make their publications available more widely to the public and book trade. To meet this need, we evolved the idea of an imprint, Leen* Editions, and purchased ISBNs accordingly. Leen Editions titles are registered with Nielsens, the main book trade database, and distributed by Central Books, based in London. Central Books already distribute for Spokesman Books, the publishing imprint of the Bertrand Russell Peace Foundation, sister company of the Russell Press. *The River Leen flows near Russell House, on its way to the Trent. Well-off Kentish man Arthur Skrene adjusts to his newly-inherited farmstead in Blidworth, Nottinghamshire, by Sherwood Forest - and the locals adjust to him! On their first meeting, his neighbour Nell Rideout appraises him to her family, "He looks keen an' all, but just not our sort o' keen." Arthur's initial pleasantries accentuate his strangeness amongst those born and bred in the Notts village, but by-and-by his is accepted as part of the community, proving to be an able manager of the High Farm and sergeant of the local Yeomanry. His proximity to the Rideouts frequently implicates him in their business, and traps him in an awkward relationship with Nell, young horsewoman and - some say - witch. Compelled to protect her brother Tant who, with Luddite purpose, goes machine-breaking, Nell's terse behaviour towards Arthur throws the brakes on the reader's early expectation of romance between the two. However, through a number of encounters and curious relationships, by the end of the tale the two families are closer than ever. Thirty-five chapters of "Yo gret sawny!" and "Why hae yer done that?" later, the Blidworth turn of phrase becomes quite familiar. One early edition of the text included glossary notes, useful but not under; where some ambiguous terms were unglossed, usually the context was enough to understand. The prose deserves special mention, purely because the dialogue is such a joy that it runs the risk of eclipsing all else. Prior's narrative style is uncommonly enjoyable, rich and effortless. His Forest Folk fully deserves its new audience. The Swinging 1760s - a time of enterprise and opportunity. The Industrial Revolution is about to change England for ever. Fortunes are being made by men, including actors/managers who are building ambitious new provincial theatres. These little empires soon give rise to bitter disputs between rival companies. 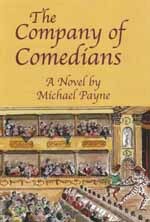 Thomas Hammond, a young Army drummer, dreams of fame as an actor if only he can join the travelling Company of Comedians. But powerful Puritans still regard theatres as dwelling places of Satan with players no better than 'rogues and vagabonds' - full worthy of imprisonment. Tom's quest finds him associated with scheming showmen, social climbers, freaks, rioters and ruthless speculators. His adventures are in turn comic and horrifying. Not only does he encounter love and jealousy, he must endure ridicule, assault and perhaps suspicion of murder in the confusion of 18th century privilege and poverty. 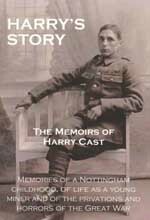 This book is a record of a Nottingham man's boyhood and youth written in his mature years as a retrospective on his life in an era very different from ours. It was published in 2015 by members of Harry John Cast's family including, especially, his daughter and granddaughters, in memory of and love for a special man. A pictoral anthology of Faces, Medieval to Victorian, in Bottesford's parish church. 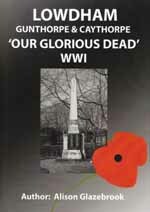 Lowdham War Memorial lists the names of 62 men from the villages of Lowdham, Gunthorpe and Caythorpe in Nottinghamshire who lost their lives as a result of their military services during World War One. This book is about the lives of these 62 individuals and their immediate families. 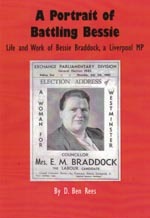 Dr D Ben Rees has brought to life the powerful and well-known Bessie Braddock who made politics attractive for 50 years on Mersyside. She inherited from her mother, Mary Bamber, a Scot, her socialism and strengthened her determination to make life better for the working class of Liverpool by her partnership with her husband Jack Braddock, a native of Hanley and leader of the Labour party in the city from 1948 till his sudden death in 1963. Dr Rees is very critical of both their involvement in the drowning of the Tryweryn valley in Wales but he also in an interesting manner indicates their political journey from Communism to the Hard Left and finally as both right wingers. Her role as MP for Liverpool Exchange 1945-1970 has been well documented, in particular her disagreements with her officers over Bevanism in the 1950s. This is a first class appraisal of a legendary figure. 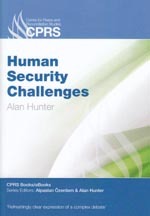 "Hunter's Human Security Challenges opens the subject up in a very accessible language for the beginner,o but it also interrogates it critically. For the more advanced reader, whether experienced scholar or undergraduate student, it is a refreshingly clear expression of a complex debate. It is a very useful summation of the whole of the debate, saving readers much time in bringing themselves up to speed with the relevant material, which is so widely dispersed; and it treats these debates with sophistication, sensitivity and maturity whilstremaining open, accessible and unintimidating. I'd recommend it as the best introduction to Human Security I've seen." David W. Roberts, Department of Politics, History and International Relations, Loughborough University UK. Dr Alan Hunter is Professor at CPRS, and also at the Graduate School of Global Studies, Doshisha University Kyoto, Japan. He works with universities and agencies in China and India. Hunter specializes in the study of peace, religion and human security: his previous publications include Peace Studies in the Chinese Century and New Perspectives on Human Security. 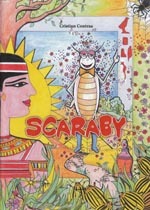 'Scaraby was born in Egypt, in the great family of Scarab beetles.' So begins an exciting adventure in the pharaoh's tomb, written for children by Cristian Contras.